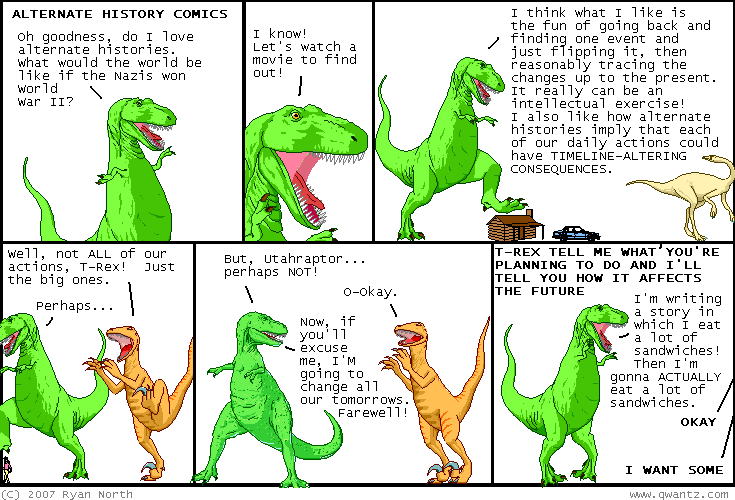 Dinosaur Comics - March 2nd, 2007 - awesome fun times! March 2nd, 2007: There are some ads for DirecTV that are kind of fun and ridiculous, in which they redo memorable scenes from older movies to sell HDTV. The first one is based on Star Trek VI, and it works, because Shatner plays it for parody. The second one, based on Back to the Future, really doesn't work. Doc is played straight (or at least, you can't tell when Doc is doing parody) and so the whole thing falls apart. Why would 1955 Doc know about HDTV? Are we now to imagine a fourth trip to 1955, DirecTV? Are we to suppose a trip through time in which 2015 Doc informs 1955 Doc of HDTV and asks him to let 1985 Marty know about it? DirecTV. Why would we do that. Also please to make a sequel commercial in which Doc shows up and grabs 1985 Marty and tells him they've got to go back to the future and Marty asks him why and Doc says "It's your TV, Marty! Something's got to be done about your TV!"